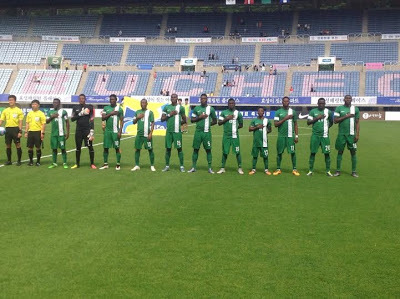 As part of preparation for the Rio Olympic Games Men’s football event, the Nigeria’s U-23 team, popularly known as the Dream Team VI will confront Mexico in a friendly match at the Aguascalientes Stadium on Saturday. Having failed to make a good impression at the Suwon four nation tournaments where the team came third behind teams like South Korea and Denmark, team’s coach, Samson Siasia, who has already been feeling the heat, knows that an appreciable impact could help motivate the players for the major tournament. The team are in US intensifying preparation for one of the greatest sports showpiece in the world and have 14 players in camp with the regular names such as Daniel Akpeyi, Musa Muhammad, Azubuike Okechukwu, Stanley Amuzie, Abdullahi Shehu, Usman Mohammed and Saturday Erimuya. The Dream Team lost their last friendly encounter against the Flying Eagles 4-3 last week Saturday and would be hoping to make amends by beating the Mexican U-23 team on Sunday.